On a third expedition Pizarro landed at Tumbes (1532) and ascended the Andes to Cajamarca, where the Inca, Atahualpa, awaited him. Professing friendship, he enticed Atahualpa into the power of the Spanish, seized him, exacted a stupendous ransom, and then treacherously had him executed. The conquest of Peru was virtually completed by the capture of Cuzco, which was later defended against Inca forces led by Manco Capac. Francisco's greed and ambition, offset his resourcefulness, courage, and cunning. A band of assassins surprised him at dinner, and although he fought desperately, he was overpowered and slain. 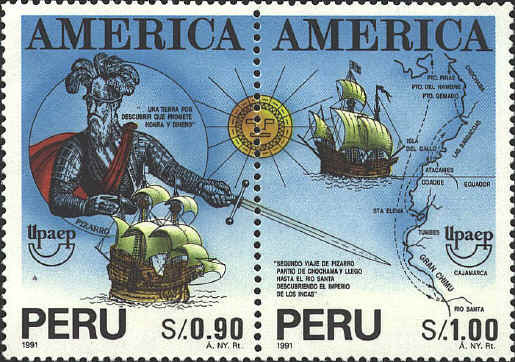 Francisco Pizzaro and his brothers conquered Peru were accompanied by Francisco de Orellana who set out from Quito to explore the interior of South America in 1541. Orellana left the main party, followed the Napo River to the Amazon, and then followed the Amazon to the Atlantic in August 1542. He told of encounters with female warriors, like the Amazons of classical mythology. 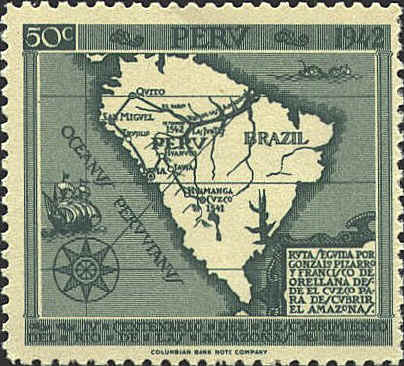 The stamp shows Orellana's route from Cuzco in 1541 to Lima and San Miguel and Quito, and from there to the Amazon and the Atlantic Ocean in 1542. The original on which the map is based is undetermined. It may be a composite of several maps of the period. Scott's catalog describes it as "Map of South America with Amazon as Spaniards Knew it in 1542."